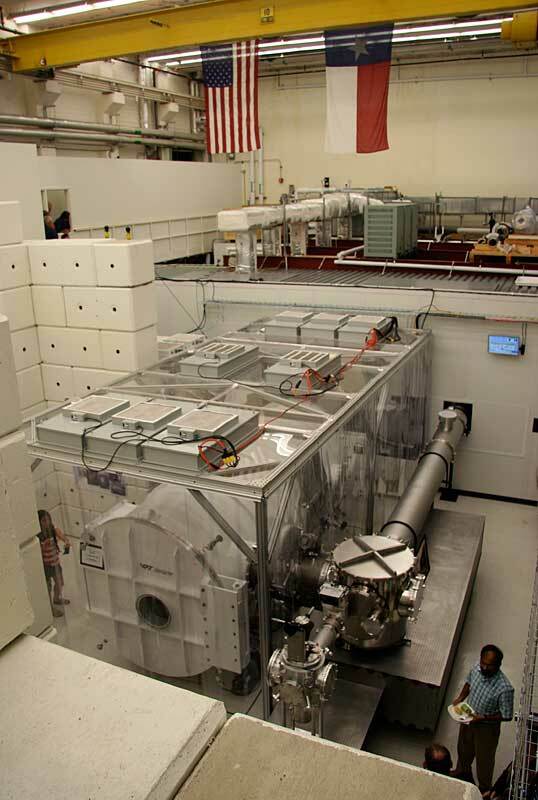 Overview of part of the Texas Petawatt Laser. Robert Lee Moore Hall, University of Texas campus. August 28, 2008. When I first heard about the giant new laser that UT was building, I had it in my brain that it was out at our Pickle Research Campus, so imagine my surprise to find it is in the basement of my own building! I've been a student or an employee in this building for 18 years (now, literally, half my life) and going to the laser open house gave me my first opportunity (that I can recall) to go to the first floor of this building. For the record, the ground level is the 4th floor. I know, it makes no sense. When I was a student, the "technology in the basement" was a Tokamak, and now it's a big giant laser. At least there weren't any lawsuits or death threats over our nifty new piece of science equipment, unlike with the Large Hadron Collider.